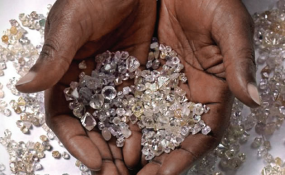 In a communique issued at the end of their meeting in New York, United States last Friday, the civil society organisations -- coalescing under the banner of Kimberly Process Civil Society Coalition -- highlighted the involvement of the army in the mining of diamonds in Zimbabwe, as well as Angola, DRC and Venezuela. Zimbabwean Centre for Natural Resource Governance director Farai Maguwu presented the case for Zimbabwe, according to the communique. At the same meeting, the communique reads, International Peace Information Service (IPIS) director Filip Reyniers proposed that the UN expand the definition of conflict diamonds to incorporate those mined with the involvement of the army in any given country -- drawing from the experience of the Central African Republic. "IPIS director Filip Reyniers presented on some of the lessons that can be learned from the conflict diamond issues affecting the Central African Republic (CAR). These include the need to expand the definition of what constitutes a conflict diamond -- a restriction that impeded KP intervention in the CAR to prevent a brutal part-diamond funded rebel coup in 2013," the communique reads. "It is time to move the KP beyond noble words. If the KP does not both reform and start seriously implementing existing recommendations, it will truly remain nothing more than a gilded talking shop. This represents a woeful abuse of consumer confidence -- a usurpation of the very tool consumers are referred to in seeking to ensure that their purchases intrinsically reflect the beauty and purity that they are supposed to represent," he added.